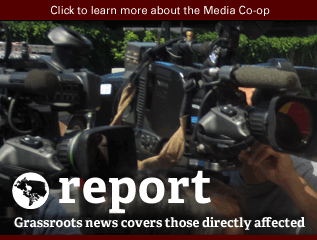 If you know of a struggle, angle, movement, investigation, co-op success story or discrimination case that the mainstream has failed to report on—here's your chance to tell us what you want to read. As member-driven media, we'll prioritize your suggestions. 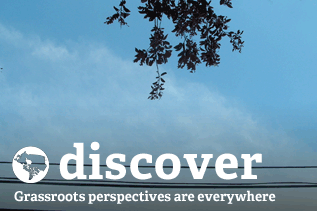 Local or national, let us know what specific topics and stories you'd like to see in our pages and on our websites. Post your story ideas, press releases and links below. 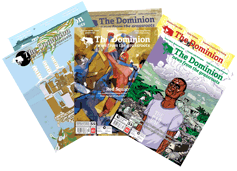 We'll consider links for The Dominion's Month in Review, and we'll send new and seasoned writers to this discussion for suggestions and story ideas. If you like a story that someone else has suggested, add your support and any additional feedback, context or resources. 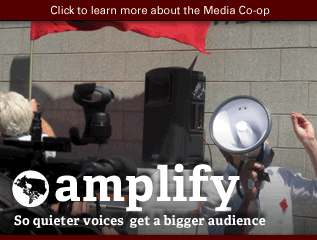 Be a part of creating grassroots, local, independent news. Submitted by Nathalie23 (non vérifié) on jeu, 02/13/2014 - 06:21. Submitted by SandraCuffe on mer, 04/17/2013 - 19:12. Over the past year, a few readers have suggested taking a look at different alternative currency projects and systems, but no one has picked it up yet. In case someone is interested in piching an article to The Dominion on the issue, the Esquimalt First Nation just unveiled its barter currency, the Tetla, which was started a year and a half ago up in Cowichan territory. Submitted by Nathalie on mer, 03/27/2013 - 05:47. Submitted by SandraCuffe on mer, 03/20/2013 - 19:23. Samuel Kühn ...police forces sending cops to Israel for training. A couple years ago I was shocked to discover that small town Belleville, Ontario sent members of its police force to Israel for training. This was reported in the local paper and I was surprised that no letters to the editor resulted. I did a bit of research and discovered that this was not isolated to tiny Belleville. I intended but never found time to file a FOI request and follow-up. Sandra Cuffe resource extraction, Indigenous governance and/or food issues in Nunavut, NWT and/or the Yukon. Michelle Clark I think it would be great if someone does an article on SkillsNS - the website available for free online learning. Submitted by RHart on jeu, 02/21/2013 - 17:51. The small town of Keno City YK has a history of minig but new mining activities now threaten the towns fledgling tourism businesses and residential community. The YK government promoted new businesses then permitted a major mining enterprise surrounding the town - driving away residents and businesses. The mining was kick started by federal grants under the presumption of rehabilitating the area from past mining abuses. 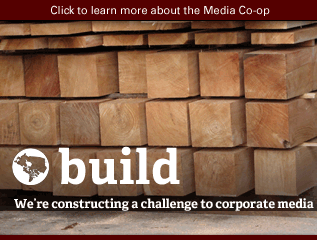 This has been reported in the Yukon media but little in the national media, though even Corporate Knights gave the issues with the project a nod - noting the government had weakened environmental conditions recommended by the Environmental and Socio-Economic Assessment Board. Submitted by SandraCuffe on mer, 03/20/2013 - 19:15. A+ to this suggestion and and any others that deal with resource extraction up north, as opposed to way down south. The territories are so undercovered, and not just in the mainstream media. Submitted by SandraCuffe on lun, 02/18/2013 - 14:24. Rachel Small ...a breakdown of what the Canadian Pension Plan (and thus a majority of Canadians) is invested in. Elisabeth Bailey homeschooling in Nova Scotia and the A.G.'s new recommendations. Shatha Tha Tha Israeli Apartheid Week! Erika Tafel The damage of compulsory schooling laws on Canadian culture and an in depth study of behavioral research on school children such as the EDI and MDI studies being implimented and carried out by canadian universities for organizations like the U.N. & W.H.O using passive consent protocols. 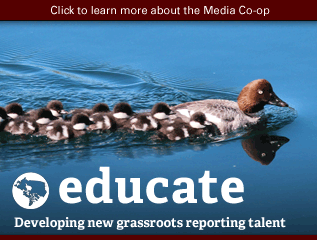 Darlene Doucet Someone should really do a story on how grassroots efforts could change our broken government. Fairness and Country before Party. Darlene Doucet ‏Someone should really do a story on mainstream media's growing lack of journalistic professionalism. They stir controversy. Barb McLeod The Journey Of Nishiyuu! Submitted by kebera on sam, 04/26/2014 - 22:11.
i would like the ability (for members) to post comments on the ads just as we can for other stories. why should we let assertions in them go unchallenged? also an opportunity to supplement ad info with testimonials. we also seem to need better spam control. Submitted by onecrustycanuck on sam, 02/16/2013 - 21:45. Submitted by ivanfmf on mer, 02/06/2013 - 16:22. More than a story this can be an editorial. Right now, with the Parti Québécois in power, the independent movement in Quebec is gaining momentum. I was recently approached by a number of artists who are interviewing other artists, intellectuals, immigrants, etc., in order to know what they think about Quebec becoming an independent nation. However, they never thought of interviewing the First Nations. This is the problem: Even with Idle No More movement making First Nations' voices be heard across the country, how can we think of independence without consulting them? How can we believe in an independence that is based on a genocide? How can we claim a land as ours when we got it by destroying other nations? Idle No More is actually a questionning of Quebec's desire for independence given that this land is not fully ours. Submitted by taramichelle on lun, 02/04/2013 - 21:01. In general I would love to see a story on Internet activism happen soon, it's been a while. Internet should be for all. Submitted by John-Albert on lun, 02/04/2013 - 19:27. Your cable and wireless costs twice as much as it does in the UK and Germany because of our current monopoly system. The internet should rather be an enabling structure set up by Canada for Canadians, to improve us as a society, as our road system was in the 1950's. Submitted by Tim McSorley on lun, 01/28/2013 - 10:46. In just four days the Government of Canada will close its environmental assessment into the secretive Trans-Pacific Partnership (TPP) trade deal. Surprised you haven’t heard about it? Harper knows that if the assessment doesn’t find significant environmental impacts, they can just skip producing a draft report altogether and move to the final report, so he's done everything he can to keep this bad deal out of the press. This deal is just another in a list of predatory trade deals the Harper government is trying to ram through to protect tar sands development and safeguard corporate profits at the expense of the rest of us. Harper thinks he can sneak this deal past us, but if we flood the process with comments, we can show we’re paying attention. Right now corporate lawyers are busy drafting a treaty that Canadians and our own MPs can't even read! The Harper government is hoping to be able to point to this public consultation as proof the process has been transparent -- he will argue that no one is worried about environmental impacts of the TPP and just move forward with no more opportunities for public comment. The TPP trade deal contains at least 26 chapters that would have a fundamental impact on the environment, the economy, jobs, access to affordable medicines, and much more. The deal will give corporations the right to acquire land, natural resources, and factories without government review, and will allow corporations to be compensated for environmental laws that damage profits. The Trans-Pacific Strategic Economic Partnership is a multilateral free trade agreement that aims to further liberalize the economies of the Asia-Pacific region. Currently, 13 countries are party to the negotiations including the Canada, the United States, Mexico, Australia, Brunei Darussalam, Chile, Malaysia, New Zealand, Peru, Singapore, and Vietnam. The TPP will impose a set of extreme foreign investor privileges and rights and their private enforcement through the notorious “investor-state” system. Under this regime, foreign investors can skirt domestic courts and laws, and sue governments directly before tribunals of three private sector lawyers operating under World Bank and UN rules to demand taxpayer compensation for any domestic law that investors believe will diminish their "expected future profits”. Submitted by Tim McSorley on ven, 01/25/2013 - 09:40. Interesting piece in the Washington Post pointing to a blogger using math to predict coups. Several of the ones marked in red on his map look to be places with intense western (and Canadian) mining interests. The article is here: http://www.washingtonpost.com/blogs/worldviews/wp/2013/01/22/map-the-countries-most-at-risk-for-a-coup-in-2013/. Would be interesting for someone to look at the ties between Western mining/nat resources exploitation and coups. Submitted by dru on mer, 01/23/2013 - 20:42. ...on what Canada's role was/is in Libya, Mali and Syria. What diplomatic action is Canada taking on these fronts. Submitted by SandraCuffe on mer, 01/23/2013 - 16:10. Al Görgön - the growing militancy of health care workers in Alberta. Many different strikes in a supposedly "conservative" province, and some of them are much of the "war of attrition" type with a scummy private health care company. Fascinating stuff. 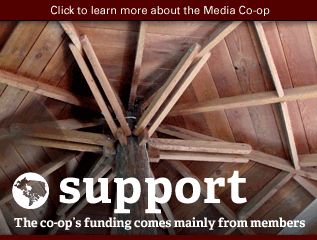 Alberta Co-op Cafe - Co-ops! 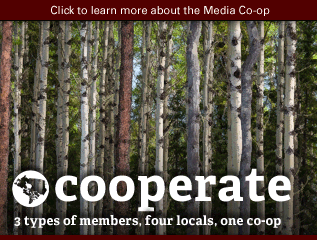 How are co-operatives addressing pertinent issues, empowering communities to play a role in the economy! Droit Au Logement - Landlords getting rid of their tenants and transforming their appartments into condos. Brendan King-Edwards - The lack of funding for alternative healthcare in Canada. Adrian Foster - Canada's mining interests in Mali. Adrian Foster - Canadian pipeline companies operating in Turkmenistan and heading for Afghanistan. 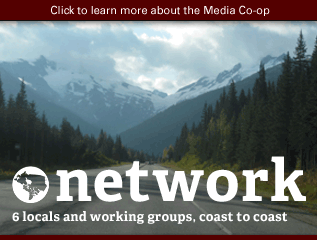 Carole Trepanier - The growing Transition Town movement in Canada. Nick Oh - The marginalization of labour and the coinciding erosion of sovereignty since Mulroney and NAFTA. Marcos Pe - how much money enters Canada from 3rd world countries. Mainly, Barrick Gold. Kyle Speaker - How to correct 'money's value' or lack of value. Many have heard of 'fiat currency' and the apprehensible and disguising lack of balance of wealth, how abt the correction. Imagine it leading to a gov't without income tax (that alone is so necessary). A world without money could(maybe) be grt, yet as a tool it does provide a currency for transactions like no other. Heather Phillips - The number of civil wars currently in progress that are not being covered by the main stream news. Yvonne Manzer I agree with Susan LeFort. PS It would be helpful to have a website Rate your Landlord like there is Rate your Doctor. Some are so notorious but newcomers, new students, have no idea. // It is so expensive to move but landlords bear none of that if they turf people just because they can. Would bee interesting to look at Montreal's strong tenants' rights. capt. jude ‏@piratesongs - re-thinking solidarity and the problem with being an "ally"? Submitted by SandraCuffe on dim, 12/30/2012 - 18:13. Erich Nolan Bertussi via facebook: Someone should really do a story on: what is with the main stream media not doing a story on [the Committee on Monetary and Economic Reform] http://comer.org/ and their [December 2012] lawsuit against the BOC [Bank of Canada]. Katia de Peña via facebook: Indigenous peoples rights, worldwide. Generally speaking, is is the same battle everywhere. We want what they have, and we have enough power to take it away, regardless of what happens to them, or the part of the planet they have that we want to log/mine/drill/frack/burn. 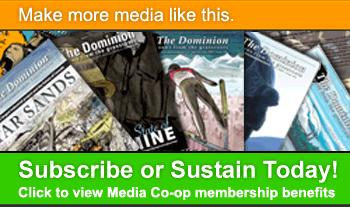 This issue interlocks with environmental protection, corporate overlordship, and main stream media failure. Andrius Rytmetys via facebook: ...the potential corruption that is happening on Native reserves. Just to see the full picture of the bad conditions there. Shelley Stephenson via twitter: on Stephen Harper's fundamentalist Religious beliefs & their influence on his governing & policies. Stephen Blumstein via facebook: 911 lie, that "al qa'eda" did it, when Mossad/CIA did. Submitted by SandraCuffe on dim, 12/30/2012 - 17:05.
suggested via facebook by George Lessard with the comment "I can provide leads and contacts for coverage... just ask," so leave a reply below if you're interested in reporting on the story and we'll put you in touch. As with most publicly funded Aboriginal organizations, The Native Communications Society of the NWT relies heavily on both Federal and Territorial government funding to deliver our Radio and Television programming to the people we serve. As of December 21, 2012 we have received neither a contribution agreement nor the funding we were for the 2012 fiscal year, a full nine months overdue. Because of this, we have no choice but discontinue our Broadcasting service. EFFECTIVE IMMEDIATELY, CKLB RADIO WILL BE OFF THE AIR UNTIL FURTHER NOTICE. Would like to cover it! Submitted by GroundWire Prod... on mar, 03/12/2013 - 14:28. Just saw this post and would definitely like to cover it. GroundWire is a community radio that airs on stations across the country and we have a segment of the show that looks into radio stations. Could I contact you privately about the situation at NCS?